This item is available for purchase in our on-line store and ships via UPS Ground. Water seed flats carefully and efficiently with this heavy-duty brass Fine Fogg-It Nozzle. 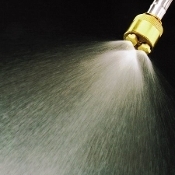 This nozzle has three mist jets which create a conical spray pattern and output a total of one gallon of water per minute @ 40PSI. 3/4" hose threads. Suggestion: experiment with your optimal moisture content before doing a large production, especially with keeping soil moist but not saturated.